This might have been a mistake. 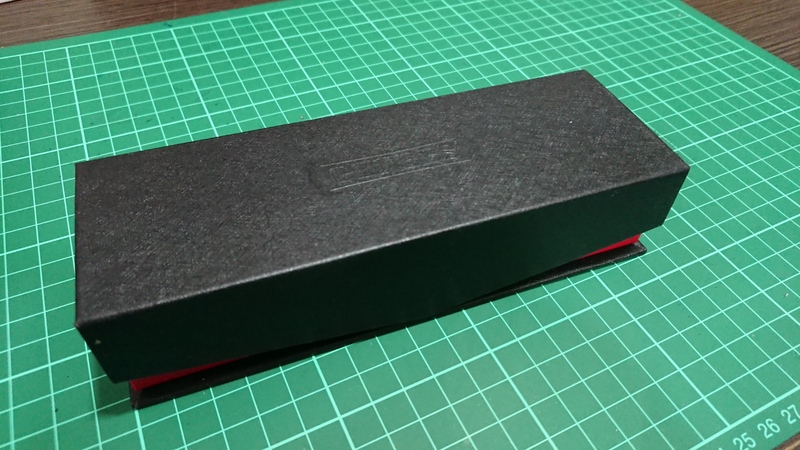 Anyway, we have the same leatherette presentation box as the previous PenBBS 469. 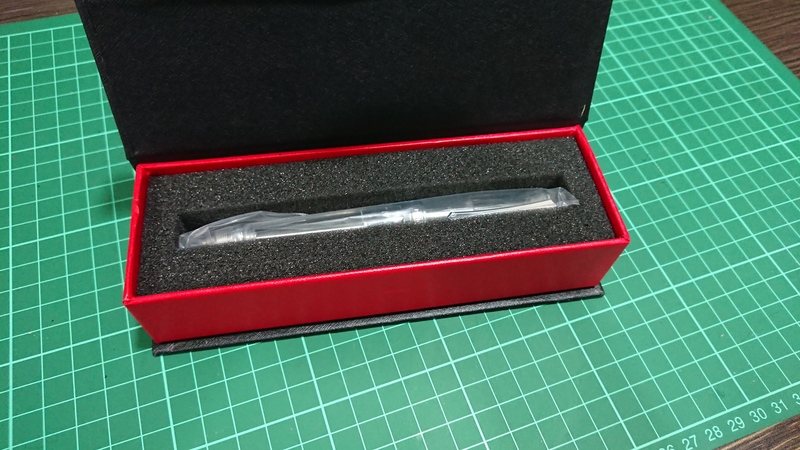 The pen is wrapped in a plastic sleeve and there weren't any other accessories for the demonstrator version. However! I was pleasantly surprised when the Galaxy version I bought had this cute little pen wrap! 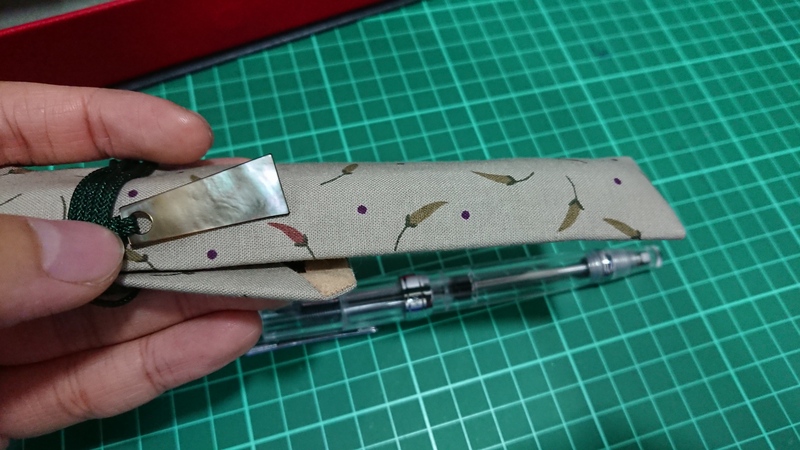 The pen wrap has red and green chili with some purple dots scattered around. Malaysians have a large appetite for spicy food in general and I love spicy food with chili padi and green chili. The toggle is made from a slightly opalescent acrylic.Looks quite pretty but it's small and thin. The inside of the pen wrap has the PenBBS logo. 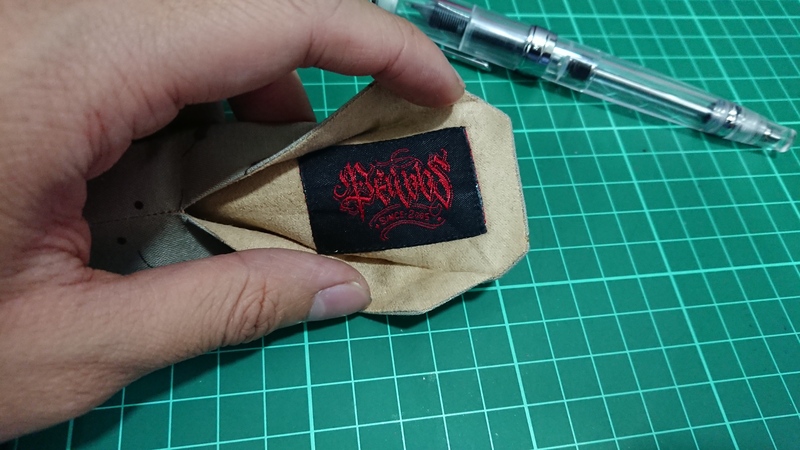 The fabric feels alright, neither too thick nor too thin. Get past the plastic sleeve covering the Galaxy 456 in the pen and there it is! 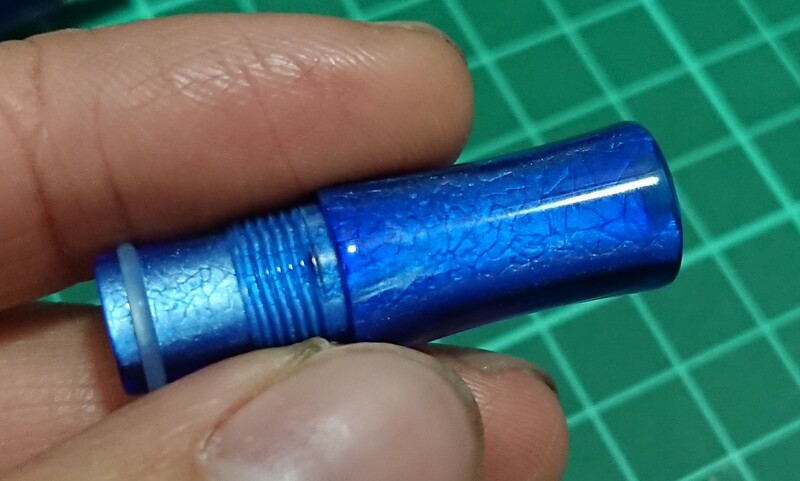 PenBBS does some good-looking materials, this acrylic is adequately named Silver River (银河), but it's official English name is Galaxy. Here's a close up of material. It's a chatoyant and translucent acrylic with dark blue base, lighter swirls of blue, grey, black and white. The white in the material is caused by light silver sparkles in the swirls. This material is used on the entirety of the pen: cap, barrel, section, finial and blind cap. 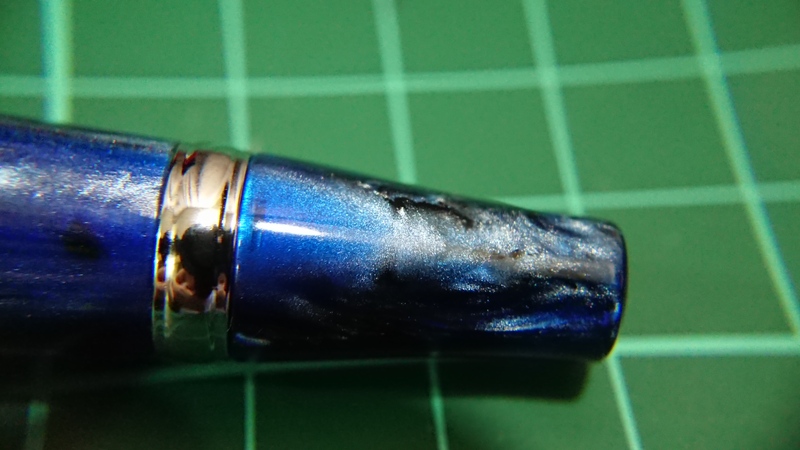 It's hard to capture on camera but you can actually see the innards of the pen in this material. It is not an opaque acrylic. Pretty sure it'll look cool when you fill it with ink though. Then, I spotted these weird cracks in the galaxy acrylic. I removed the nib and found out that it was actually just some of the material settling weirdly when it was made. A mere cosmetic defect which I can overlook. Alright enough about the material. The pens are nicely polished, only available in silver trim which are absurdly shiny, has a nice stiff and sharp-looking clip. They have a wide cap band and metal section threads. The demonstrator version is slightly cloudy. The pen uncaps in 1.5 turns. The nib is a stainless steel PenBBS Fine nib (only option) that's similar to Jowo #6. It has a gorgeous gold plate and good scrollwork reminiscent of Sailor double tone nibs. These nibs are friction fit into their nib housings which can be unscrewed from the section. 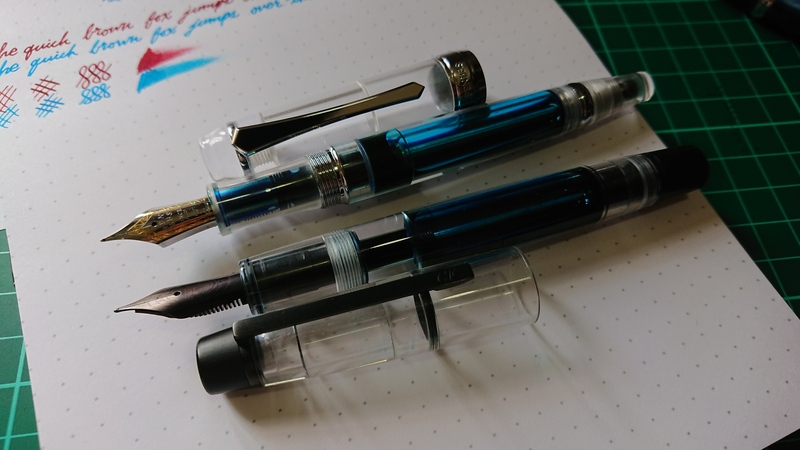 A quick size comparison with a Conid Minimalistica and they turn out to be very similar in size but note that the PenBBS 456 has the funky "indent"on the cap finial and there's a massive taper at the blind cap. Both pens have a secondary reservoir with a shutoff valve that is the plunger in their filling mechanisms. The filling mechanism works decently but there's some flaws that will become more apparent as you watch the video. 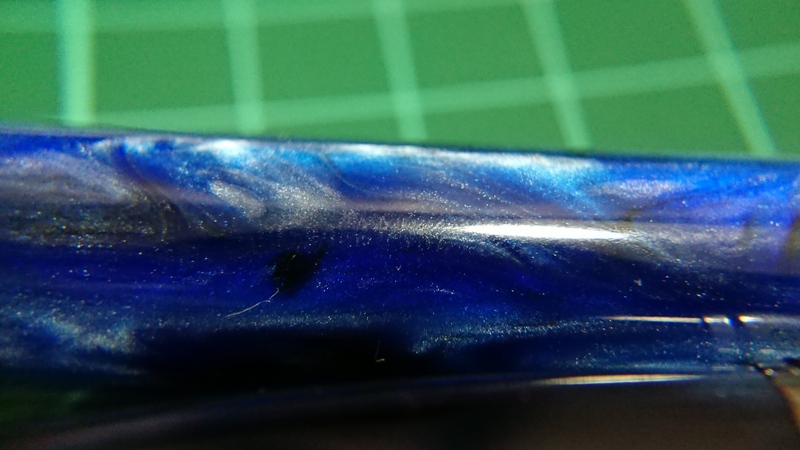 The pen has a secondary seal that relies on an o-ring on the section, you can see the o-ring on that photo of the Galaxy section with the weird patterns earlier. 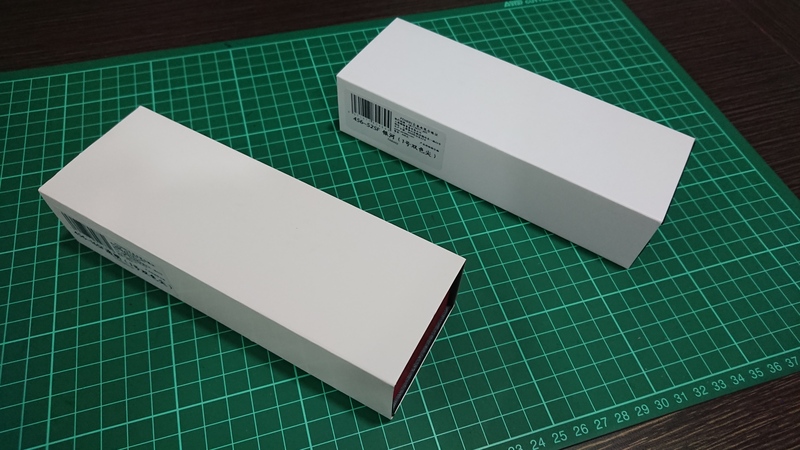 This secondary seal ensures ink doesn't fall below the opening in the section but if you dissemble your pen and did not reinsert the section correctly, there can be a gap in the o-ring seal where ink can seep below the seal and it will not reach your nib. Moreover, o-rings don't last forever, they can deteriorate over time but it's not exposed to the environment or stress so it should last a very, very long time. I highly recommend to apply some silicone grease if you take out the section to ensure the o-ring's seal does not have gaps from improper installation. 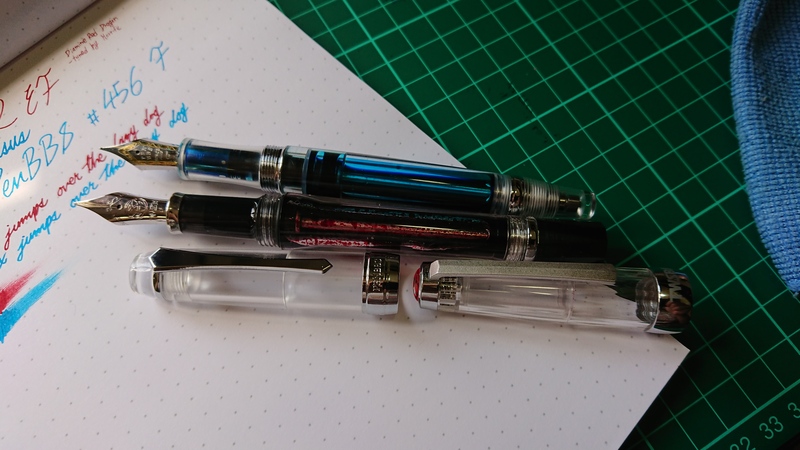 The vacuum release chamber is just a really tiny step compared to other vacuum filling pens out there (TWSBI Vac and Pilot Custom 823 have a very large flare outwards). However, this doesn't stop it from filling well. The pen takes up about 1.3-1.5mL on it's first stroke and can fit 2mL in it's barrel. 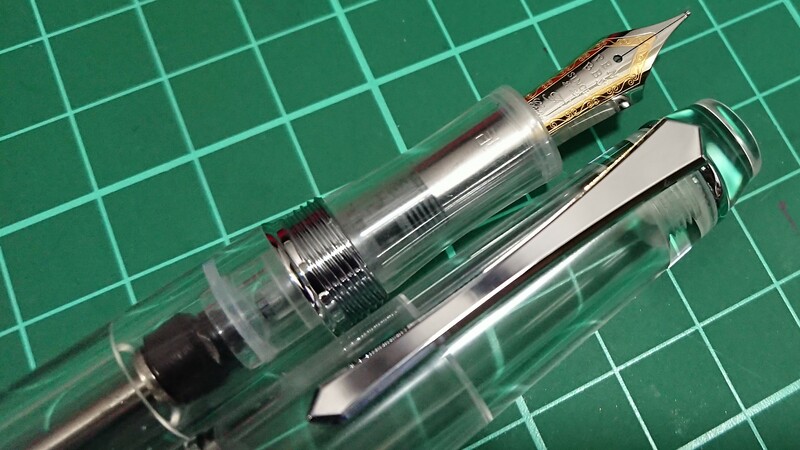 Lastly, the filling mechanism can be disassembled from the pen with a good ol TWSBI wrench. The pen actually wrote well out of the box but I did a slight tine adjustment to make certain that they weren't touching each other. Decently wet Western Fine nib size, comfortable to hold. This product's design was heavily influenced by the TWSBI Vac 700R which it was made to compete with. Huge shout out to Horr Wai (horriefic on the Fountain Pens Malaysia Discord) for lending me his Vac 700R EF which he tuned very well. Both pens use a #6 size nib. 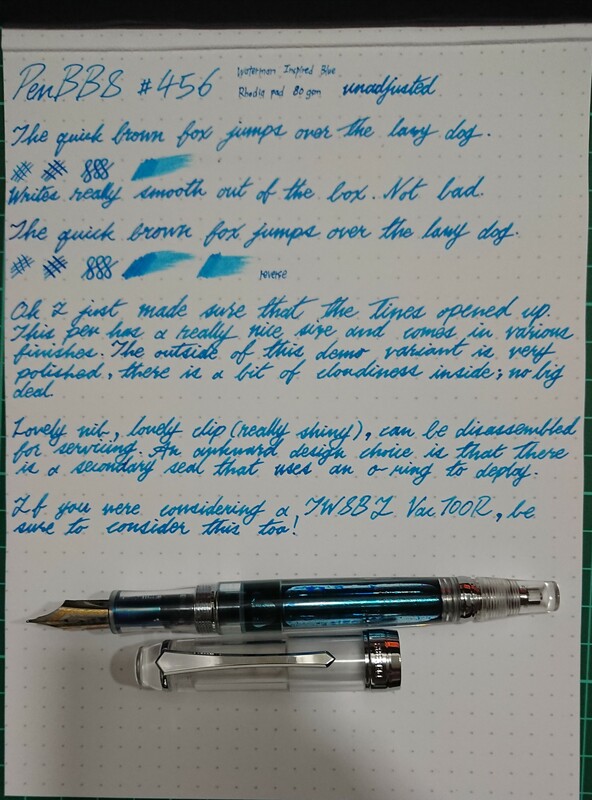 PenBBS nibs tend to require a little adjustment before they work well though I got lucky with this one whereas TWSBI uses Jowo nibs which have a good reputation for working well out of the box. 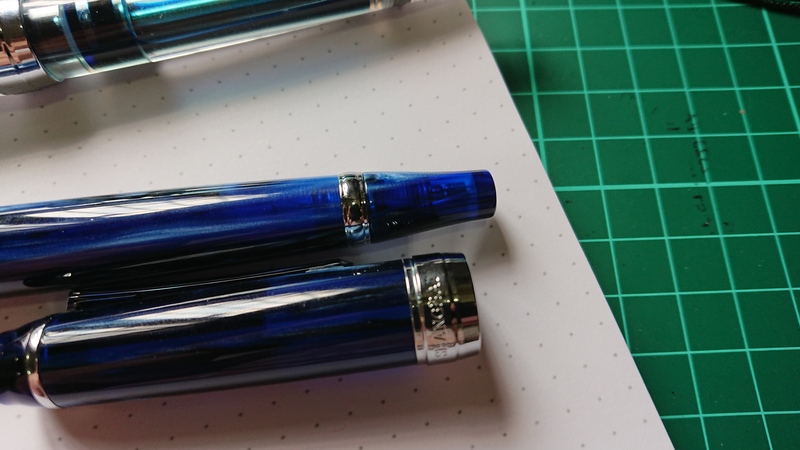 The PenBBS 456 has metal section threads and much smaller steps compared to the the TWSBI Vac 700R which has plastic threads and an o-ring (prevents overtightening). 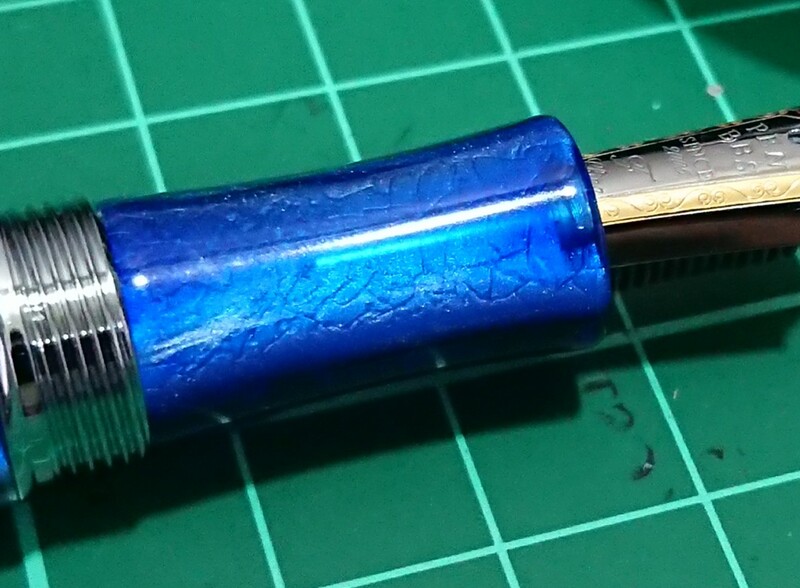 This makes the PenBBS 456 more comfortable to hold for some people. 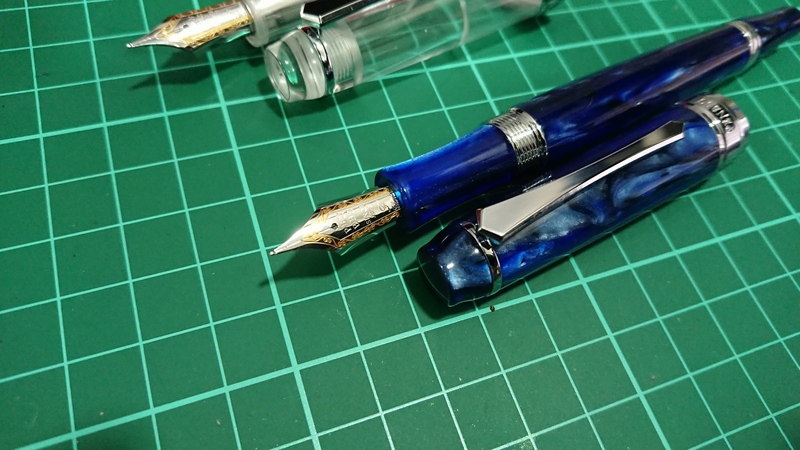 Both pens are very similar in length but the PenBBS 456 can be posted very well due to the large taper at the blind cap whereas the Vac 700R cannot post at all. Both pens have nib units which can be unscrewed out of the pens. The Vac 700R stores about 0.5mL more than the PenBBS 456 due to the lack of the section o-ring seal. 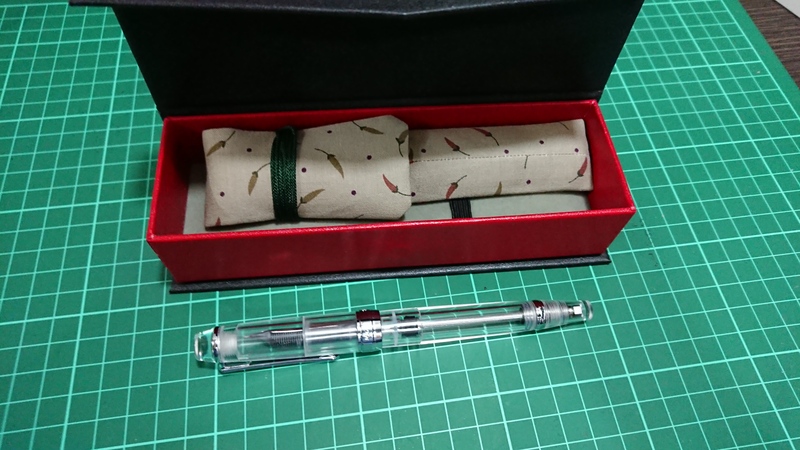 The Vac 700R also has a faceted cap and blind cap compared to the smooth PenBBS 456. The finial of the Vac 700R has the TWSBI logo in it whereas the PenBBS 456's finial is just a plain piece of acrylic. Lastly, the clip of the PenBBS 456 is an absurdly shiny, smooth simple stiff clip vs the rougher, sandblasted spring-loaded clip of the Vac 700R. 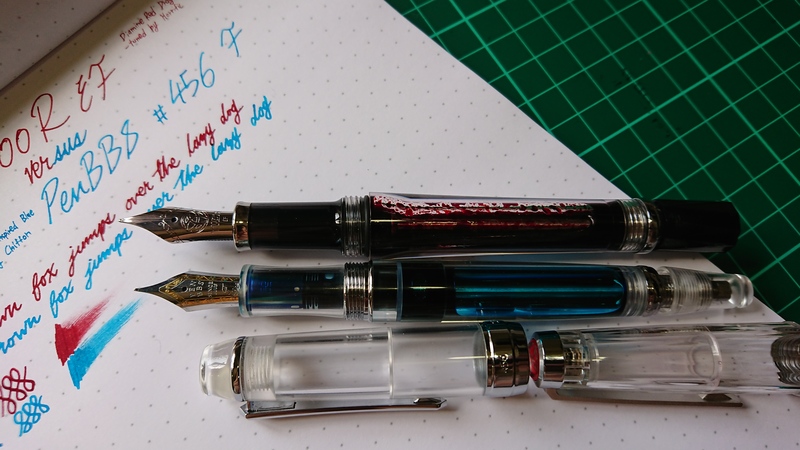 Let's not forget that the PenBBS 456 comes in fancy acrylic colors compared to the Vac 700R and Diamond 580. The verdict? 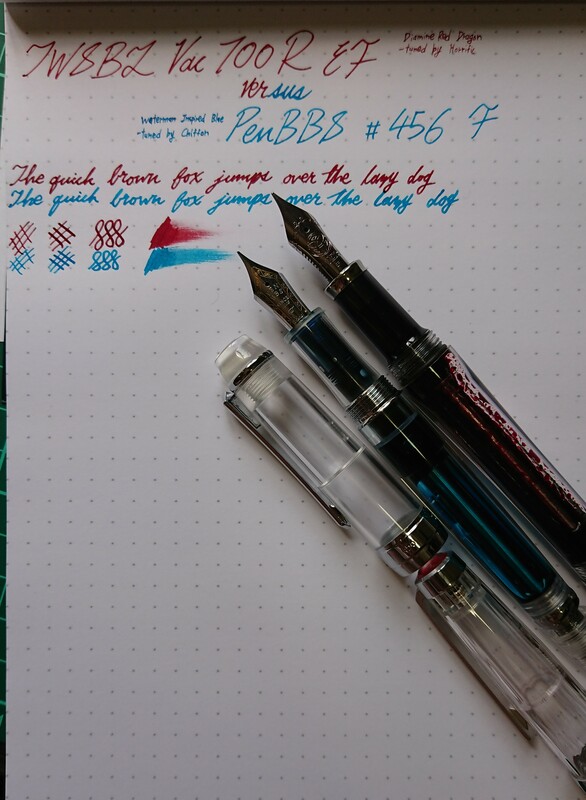 If you know someone who wanted an affordable vac filler but they can't come to terms with TWSBI for various reasons, then the PenBBS 456 is a solid recommendation. 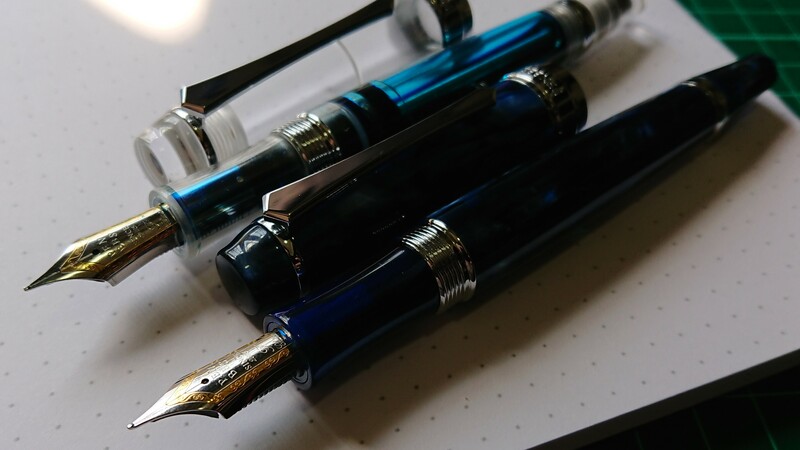 Disregarding TWSBI, the pen is well made for it's price bracket with a good choice of colors. You may need to adjust the nib otherwise they write well. 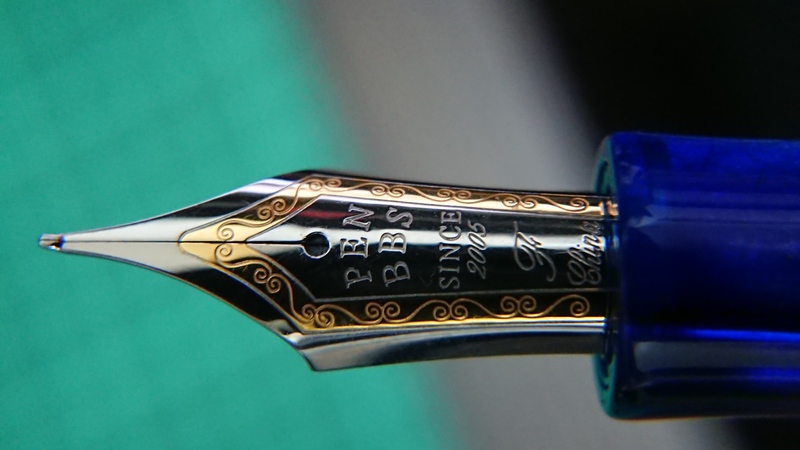 I haven't heard much about PenBBS's customer service but I guess it's because they don't crack out of nowhere. Wow this o̶v̶e̶r̶v̶i̶e̶w̶ review took some time. I hope you enjoyed the thorough overview which I did not intend to do lol. See you next overview!